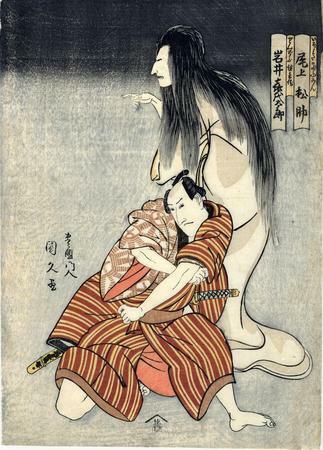 A dynamic ghost scene from the debut in 7/1804 of Tenjiku Tokubei ikoku no banashi at the Kawarazaki Theater in Edo. Matsusuke was lauded for his performance in this role. Kunihisa was a talented contemporary female artist in Toyokuni's early studio with Kunimasa. She is known by only a few designs, all featuring ghosts. Toyokuni also produced a haunting rendition of Iohata at the same time, but published by a different house. Illustrated in black and white in a small reproduction on page 332 of Masterful Illustions: Japanese Prints in the Anne van Biema Collection.